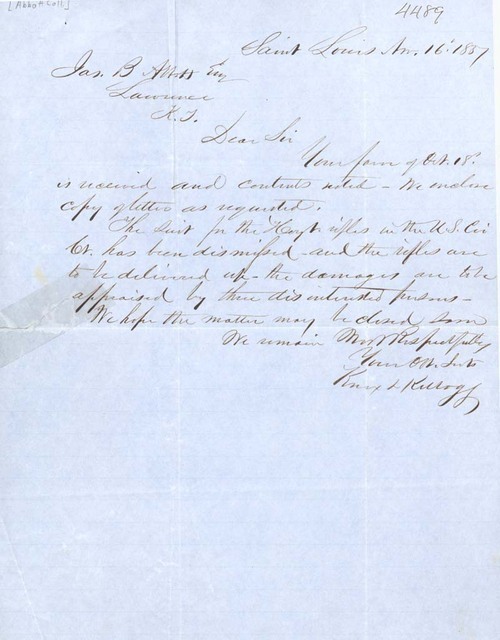 Attorneys Knox & Kellogg wrote from St. Louis to James Abbott in Lawrence, Kansas Territory, responding to a lawsuit brought against them by Samuel Cabot. Cabot held them responsible for the long delay in returning several rifles that had been stolen from him the previous spring by Missouri "Highwaymen." Knox and Kellogg reported to Abbott, acting as agent for Cabot, that the lawsuit had been dismissed and the damage to the rifles was to be appraised by a third party.